You can spend months or years developing what you think to be the most powerful and useful application. But when you're done you can find out, to your total surprise, that it's actually not as demanded by users as you expected it to be. That's when you start wondering what's going wrong. Maybe users don't quite understand how to use it? Or it's difficult for them to navigate? Will they come back and use it again? That's the questions each developer should ask himself before launching any web application. Application has to be simple and clear so that users can quickly perform basic tasks and get the desired result. This trend becomes more and more popular. Users like it as using web application means they don't have to install any software, get regular updates whatsoever. So the main thing is your software should be simple. In case the user is overloaded with information or he finds it difficult to interact with the application he will look for something else. Eventually, he'll end up with one of your competitors. Don't make it happen. To prevent this you need to start communicating with your prospective users. Effective communication is your key to success. When your application is in Beta it's a good time to start. You need in order to know whether you are heading in the right direction. Will the application you're working on meet users expectations? Best way to find out is ask them. Invite potential users of your web application to become beta testers. You can offer them discounts, free downloads, etc. Show them that their opinion matters and will be considered in web application improvement. How should this process be organized? How to get the customers feedback and have it all centralized in one place? 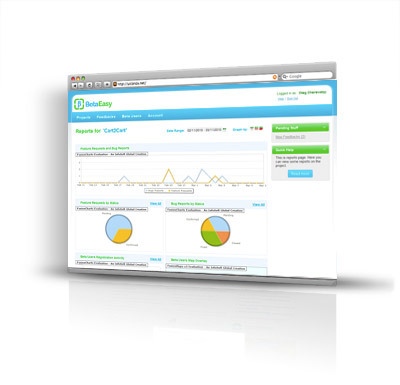 There are web services which enable you to effectively manage user's feedback. This means that you won't have to collect feedback from your e-mails, submitted tickets, etc. How it works? Everything is pretty simple. For example, BetaEasy, customer feedback and beta management service. It allows you to place "feedback" button on your application. When users want to submit a bug or request any features all they have to do is click the button. Users can vote for most urgent bugs and most desirable features. Thus, it's easy for you to see the priorities. What's essential is that you not only view users' comments but act accordingly: fix the most urgent bugs and implement most desired features. Only in that case you can establish long-lasting confidential relationships with your current and potential users. Which means they will help to make your application even better. It doesn't take much of your time or efforts and the results won't keep you waiting. Try it out and you'll see all the benefits for yourself!